The Friends of the Library, FOL for short, is an organization founded to develop and maintain citizen interest and participation in the growth and development of the community's public libraries and to stimulate the use of the Library's resources and services. For "Friends of the Library" locations, check our "Used Books" page or download the Used Bookstores Location Map (pdf). Friends of the Library provides funds for the library to offer a wide variety of public programs. For children: Summer reading activities & reading clubs, preschool & toddler story times, year round programs on animals, crafts, music, nature, poetry, theatre, and writing. For adults & families: Family films, new releases, foreign films & classics, concerts, community jams, hobby and craft workshops, cultural heritage & diversity programs. The Rover brings the library to over 300 children & caregivers in child care centers throughout the Fontana Region, strengthens classroom literacy, and sponsors training workshops to improve parent/teacher education. FOL raises money for the purchase of books, books on CD, DVDs and magazines. The bestseller rental program provides more copies of popular books, and Friends for Life & A Decade of Books programs buy new books in honor of life members. There are opportunities at the FOL Used Book Stores and the Fontana Regional Libraries. 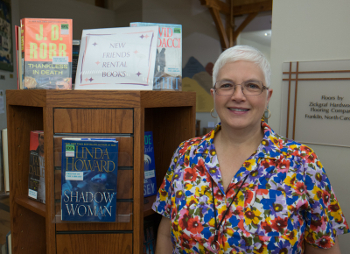 During 2013, volunteers gave more than 5,700 hours of service at the Bookstore and more than 2,985 hours at the Library. FOL develops & maintains citizen interest and participation in the growth of the Library County Fair Booth, Town of Franklin’s Appalachian Trail Conservancy Community, Chamber of Commerce Membership, Red Cross Blood Drive, and many more community outreach events. FOL works to increase the visibility and use of the library as a vital part of the community. They support Library Legislative Day to secure state funding for libraries; contact local elected officials to secure local funding; work with civic and community groups. FOL helps the library keep its technology equipment up-to-date with matching funds for technology grants like the Bill & Melinda Gates Foundation grants. Please visit your local Friends of the library websites and pages listed above for more information about getting involved.